Holding the distinction of being the financial capital of India, the city of Mumbai on August 29, 2017 once again saw a nightmare that few of its citizens could imagine. The floods on that fateful day brought one of the most urbanised cities in the country to a halt. In a recent study, scientists have projected that heat in South Asia could exceed survivable levels by 2100, creating serious threats to the health of the population and public health order. Both the cases can only lead us to question if Indian cities are well equipped to tackle the menace of extreme climate events. Being one of the top agendas for many to discuss, deliberate upon, and find solutions to, the subject of climate change regularly creates sensations everywhere. And ever since I got interested in the subject of climate change, one particular thing which I feel has been missing from the discussions is talking about trees! Instead of pondering over high-end technologies in mitigating climate change, about climate finance and its other ways to help save the environment, a much simpler solution is provided by trees. It is a simple thought, yet a difficult task with regard to its sustainability, maintenance and implementation. Because, development is all about building and re-building. There’s little interest in creating the basic infrastructure that would have the potential to take away all the environment’s comeuppance and make a city smart in the true sense – where both the health of its population and the climate stay relatively fine. Trees also have an aesthetic and visual appeal which could enhance one’s mental health. In the 21st century, the world we live in – the cities in urban zones and rural far-away countrysides – has been transformed by globalisation. At the same time, science and technology have connected the lives of human beings and the natural ecosystem with its creations and subsequent developments. These developments have come at a cost – the climate is changing and this is a challenge facing today’s society at large. With the increase in population, climate change presents a unique challenge for people living in urban regions. It is projected that with changes in weather conditions and climate events, there would be a huge impact on the population and various issues like health ailments would rise. Extreme events have the potential to generate warmer and more frequent hot days and nights and fewer cold ones over most land areas. They would lead to warmer temperatures, increase in the frequency of heat waves, heavy precipitation events, increase in drought, intense tropical cyclone activity, with other threatening climate events, with an assumption that all the aforementioned events are virtually certain and most likely to occur. As a result, it would have a negative impact in the population’s livelihood and comfort. India is the fourth fastest growing economy in the world and has undertaken a gamut of development policies for the growth and development of the country for the next few years. Out of the many policies, one that strikes the most is the ‘smart city’ plan. In the previous decade, studies from NASA’s satellite data confirmed that ‘urban heat islands‘ (UHI) were responsible for an increase in rainfall events around cities by using the world’s first space-based radar aboard NASA’s Tropical Rainfall Measuring Mission (TRMM) satellite. It has been observed that cities tend to be 1 – 10 degrees Fahrenheit (0.56 – 5.6 Celsius) warmer than its surrounding suburbs and other rural regions. The added heat can lead to destabilisation and change the mode of air circulation in and around cities. By 2025, it is predicted that 80% of the world’s population will live in cities. It is now more than ever extremely essential to better understand the impact of urbanisation on the earth system. UHI is created in large cities as a result of excessive artificial urban surfaces. For example, concrete and asphalt act as a giant reservoir of heat and make cities hotter. The stored heat is absorbed in the day and released at night. The pollution arising from automobiles and other sources are responsible for increasing emissions, which has the potential to increase the phenomenon of global warming. In the context of Indian cities, with rapid economic progress, the lesser emphasis on green techniques in developing urban centres is now a major concern. It is necessary to understand the impact of rapid urbanisation on local climate. India’s cities are becoming heat islands. The threat of deadly heat waves and how they might affect health in cities cannot be ignored. It is a public health crisis that is just looming around the corner. Researchers have warned that a warming climate would result in an increase in the frequency and intensity of heat waves. It is observed that UHI experienced by many cities is larger at night than during the day, more pronounced in winter and is more apparent when weaker winds blow out. The combined processes of rapid industrialisation and population growth in the last few decades have been significantly affecting the urban climate of major Indian cities and other developing cities leading to imbalances in the regional climates. 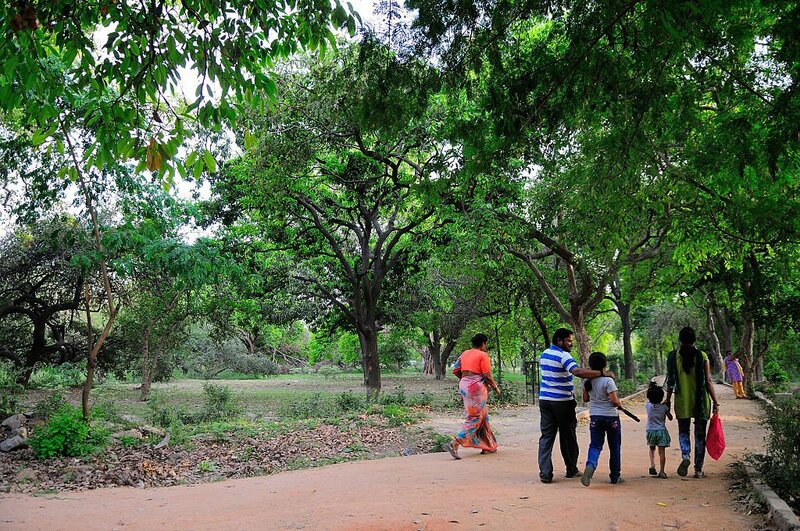 The soothing green color of tree canopies has been decreasing in cities where the pace of urbanisation is higher. Trees can benefit us a lot, especially in urban areas like cities, by providing urban biodiversity and helping to create a favourable habitat for humans and other animals. For climate change mitigation, mature and fully grown trees could play an important role where cities have a higher degree of pollution by improving the air quality. A mature tree can absorb about 150 kg of CO2. More the number of trees, the higher the CO2 emission arrest. 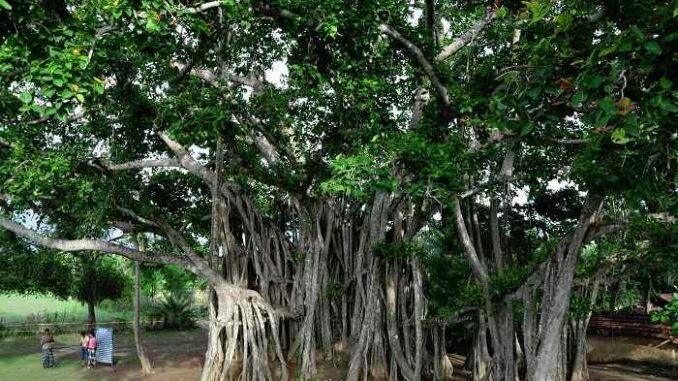 Mature trees have the potential to regulate the flow of water and in the case of urban floods, they could play a key role in mitigating the effects of anthropogenic disasters. So, it is important now, more than ever, to think if a mass scale project for trees, and its survival can be projected, implemented and sustained. As Indian cities grows, to make them more resilient, and sustainable for the citizens, green tree cover is a must.